There is nothing like being a tourist. This dramatic shot was from a tour we went on in the Everglades. I think I paid three dollars to hold Snappy and get my picture taken. Then, in the gift shop, you could buy a t-shirt that boldly stated, "I held Snappy!" Now, taken out of context, this type of shirt could get the crap beat out of you in certain places, so I passed on the t-shirt and settled for the brief, but memorable experience of holding Snappy. I have a similar photo somewhere of me holding an Iquana in Cozemel. 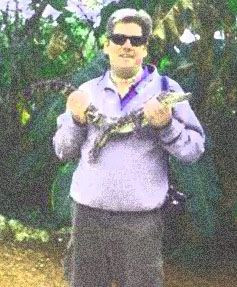 I also have a photo of me in Grand Cayman holding a Stingray. Then there is the shot in Puerta Vallarta being kissed by a dolphin. Perhaps someday I will scan them and share them with you, too. Because, god knows what else I can do with them. They would be a nice companion exhibit to go along with my series of photos pointing at the various trash cans in Disneyland and Californian Adventure. Each land has it's own themed trash can. As I said, there is nothing like being a tourist.